Maximum performance 40 KV/7 mA/280 Watt. Continuous operation at 280 Watt only possible with a high efficient air cooling system. End grounded air cooled metal ceramic X-ray tube with 1 x 1 mm focal spot and 1 mm Be window. The X-ray tube is fitted directly to the HT generator by means of a silicon-rubber pad and can be easily changed in the field. Complete X-ray source integrated into one block with control, HT generation and X-ray tube. Versatile mains input, microprocessor control with RS422 serial interface. 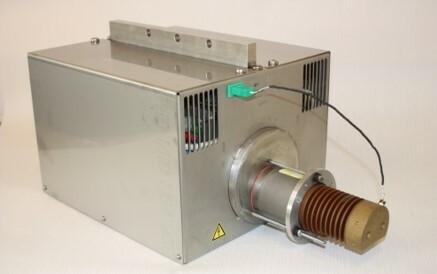 As the MB40-7 X-ray source is made of stainless steel and is designed with a special, robust power supply, it is well suited for harsh environments. A major application is fully automatic material sorting and inspection machines for light density materials, where high dose rate of soft X-ray is required. 3mm focal spot.